This book covers hydraulic transients in a comprehensive and systematic manner from introduction to advanced level and presents various methods of analysis for computer solution. The field of application of the book is very broad and diverse and covers areas such as hydroelectric projects, pumped storage schemes, water-supply systems, cooling-water systems, oil pipelines and industrial piping systems. Strong emphasis is given to practical applications, including several case studies, problems of applied nature, and design criteria. This will help design engineers and introduce students to real-life projects. This book also: Presents modern methods of analysis suitable for computer analysis, such as the method of characteristics, explicit and implicit finite-difference methods and matrix methods. Includes case studies of actual projects. Provides extensive and complete treatment of governed hydraulic turbines. Presents design charts, design criteria, and approximate methods. 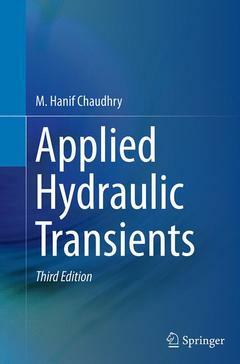 Applied Hydraulic Transients, 3rd Edition is an ideal book for senior-level undergraduate and graduate. students as well as practicing engineers and researchers. Basic Concepts.- Transient-Flow Equations.- Characteristics and Finite-Difference Methods.- Transients in Pumping Systems.-Transients in Hydroelectric Power Plants.- Transients in Cooling Water Systems.- Transients in Long Oil Pipelines.- Periodic Flows and Resonance.- Cavitation and Column Separation.- Transient Control.- Surge Tanks.- Leak and Partial Blockage Detection.- Transient Open-Channel Flows.- Appendix A. Design Charts.- Appendix B. Transients Caused by Opening or Closing a Valve.- Appendix C. Transients Caused by Power Failure to Pumps.- Appendix D. Frequency Response of a Series Piping System.- Appendix E. Water Level Oscillations in a Simple Surge Tank.- SI and English Units and Conversion Factors.